You are here: Home / reviews / hot sauce / Texas Pete’s new Sriracha sauce – CHA! 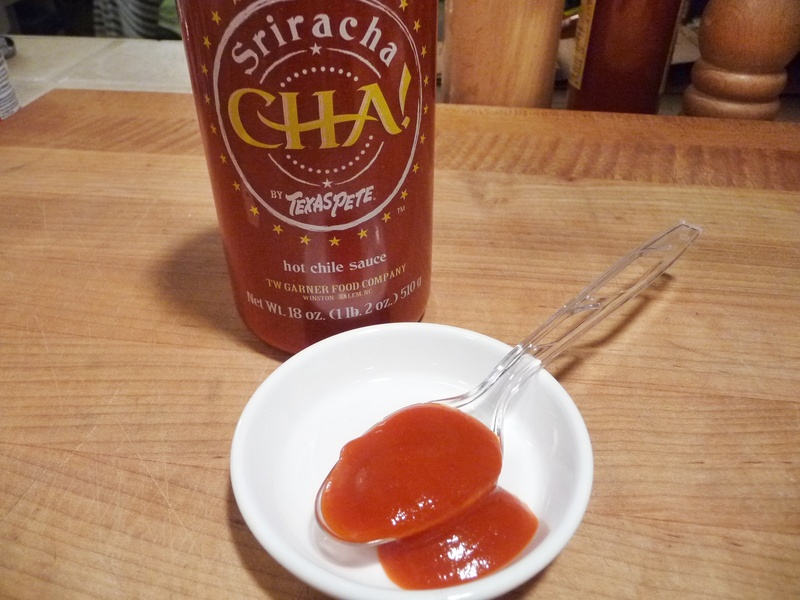 Texas Pete’s new Sriracha sauce – CHA! 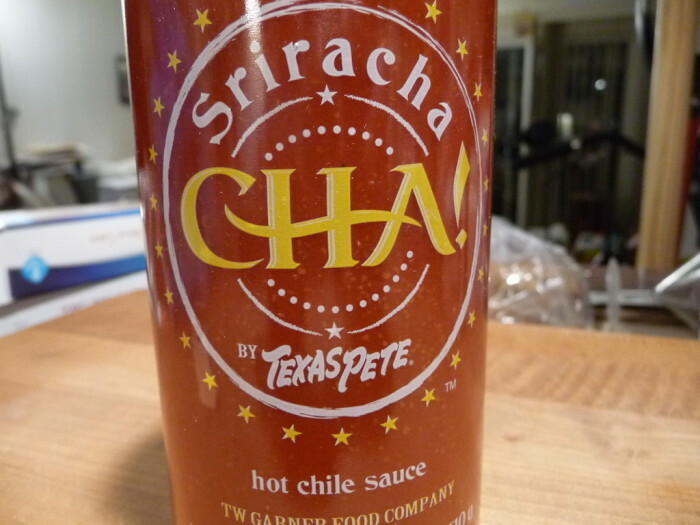 Big, bold and savory – Texas Pete enters the Sriracha sauce niche with their new CHA! Sriracha hot chile sauce. We cracked open this company provided sample not quite knowing what to expect. Texas Pete and Sriracha? Yup! It works! It turns out Texas Pete indeed developed an authentic tasting Sriracha style chile sauce using fresh red chiles. New CHA! by Texas Pete® Sriracha sauce offers a bold, balanced flavor that you will love. With fewer preservatives than other Sriracha sauces, CHA! by Texas Pete® offers extraordinary flavor, color and consistency at a more affordable price. I have to agree with that statement on every count. It is bright red in color, consistency is rich and medium-bodied, and the flavor is sweet, garlicky and bold with a nice heat level. Texture & Appearance: Slightly pulpy in a medium thick sauce that’s bright red in color. Classic. Taste Straight Up: True to form for a Sriracha style sauce, bright tasting fresh chiles are up front with a big garlic hit followed by sweetness. Well-balanced. Texas Pete CHA! 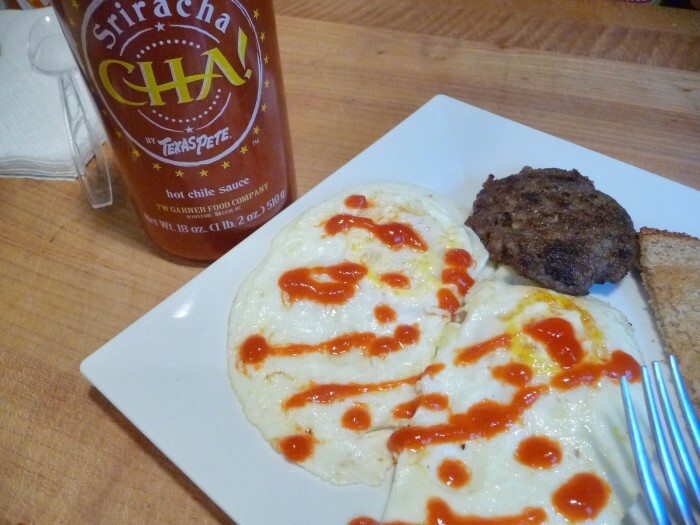 Sriracha on eggs. A classic use. Heat Level: – A nice tame level of heat here. This does not detract from the overall enjoyment of this sauce. As a matter of fact, we feel it’s a more approachable Sriracha sauce for many. Kudos to Texas Pete for creating a Sriracha sauce that should do well in the mainstream. Spicy. Label/Graphics: Packaged in a large 18 ounce clear plastic squeeze bottle, the label is a clear, 2 color white and yellow design with clean graphics and fonts. CHA! is clearly the name of this sauce. Bonus points for the awesome “flip top” pointed cap. A very nice touch! Classy. The flip top is a winner. This is a great example of a Sriracha style sauce that you can share with family and friends that have never experienced the garlic, fresh chiles and heat that is Sriracha. Overall Rating: – Perfect for everyday use and a great “beginner” Sriracha sauce. 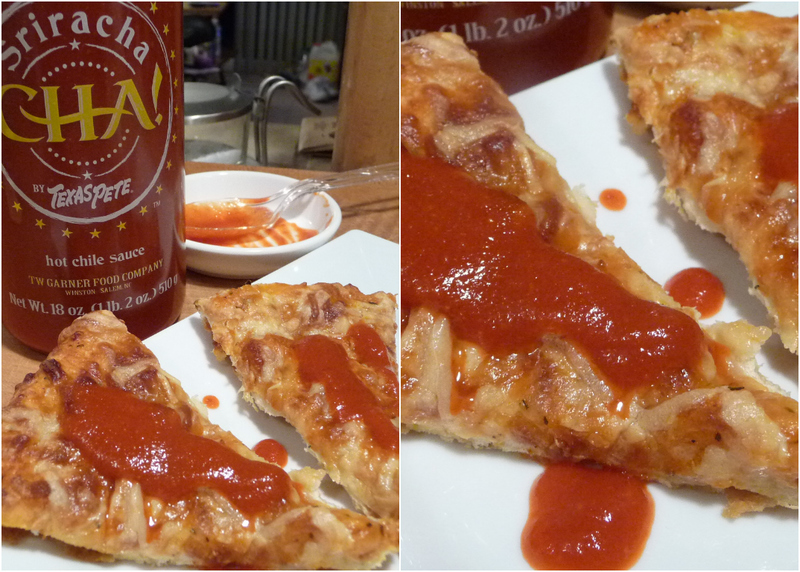 Flavorful enough for the experienced Sriracha user, and accessible to everyone at your local grocer. Versatile. Where to buy: Currently shipping to Lowe’s Foods, Food Lion, and Harris Teeter; Publix stores and more to come. T.W. Garner Food Company, sole owner of Texas Pete® and its products, are now in their 80th year of business. Visit http://www.texaspete.com/ for all of their products and where you’ll find a Store Locator feature. And check out The Legend of Texas Pete for a bit of history. A good read. We would love to hear your thoughts about Texas Pete’s CHA! Sriracha or our review in the Comments below! Great review for Texas Pete’s CHA. I have yet to see this in our local stores but will be keeping an eye out for it. Thanks, Tango Joe! I’m thinking this sauce will be available at many stores soon. After all, it is Texas Pete. Appreciate your comment and thanks for reading! I would not hesitate to recommend this sauce to any sriracha or hot sauce fan who is looking for a solid player in their cabinet. I think it will give Huy Fong a run for the money once this reaches wide distribution and folks start looking for a flavorful, well-balanced sauce. Just bought my first – and last – bottle of Texas Pete’s Cha. The heat was ok, but I was expecting more garlic. It also has a bit of a bitter finish, I think. The price point is fine, and I do like the flip-cap, but I’m willing to pay a bit more for a sauce that has a more diverse flavor profile. Glad I tried it, but won’t be back for second’s once this bottle runs dry. Thanks for that feedback, Matthew. Other than Huy Fong, what is your favorite sriracha sauce? Hi Matt & Brian. As a co-owner of Carmichael Foods LLC, I may be biased, but Siri Sriracha Sauce does it right! The Original recipe is a traditional family recipe brought over to the USA straight from the heart of Thailand, and for those that like to mix it up, in addition to Original recipe, Siri Sriracha Sauce also comes in Basil, Lemongrass, or Ginger. I do like the Huy Fong Rooster Brand and Texas Pete’s Cha brand, but they are both lacking. Huy Fong Rooster Brand is lacking the traditional sweetness, and Texas Pete’s Cha is missing the garlic depth. Having spent several years living and working in Thailand, I had the chance to taste dozens and dozens of local brands, as well as sriracha sauce family recipes. Siri Vichianchay, a co-owner at Carmichael Foods LLC, and the force behind Siri Sriracha Sauce has crafted a traditional sriracha sauce which our fans use as a condiment as well as a cooking base. While we are a very young company that is just starting out, we are already received great feedback from our community of Siri Sriracha Sauce fans. Thanks for your comments and feelings about some of the Sriracha sauces we’ve reviewed here. You are certainly welcome to mention your own sauces… they sound interesting. Ultimately, this post/review of Texas Pete’s CHA! has generated quite a bit of discussion and opinions. Good times! What do you think about a side by side comparison of a big player and a small player in the hot sauce world? Oh yeah, let’s not forget that flip cap! 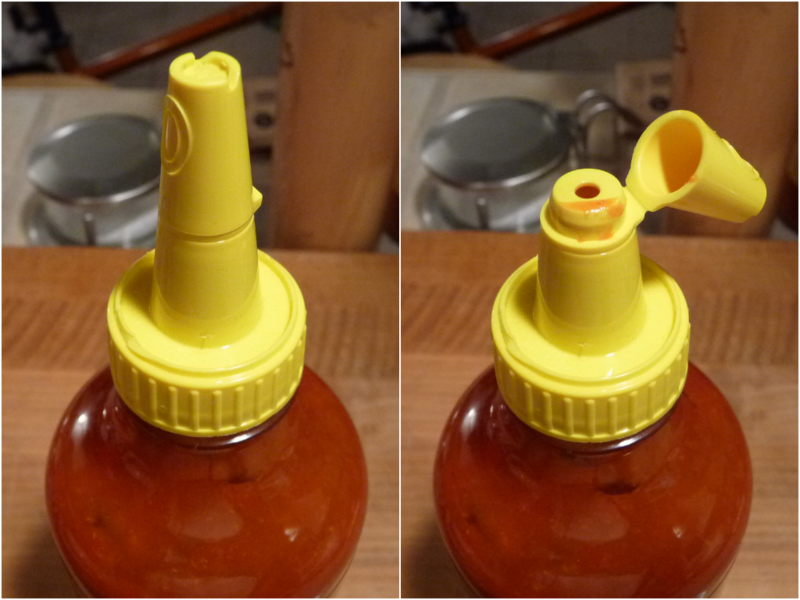 I’ve been using Sriracha (Huy Fong) and there are times when the tip gets clogged. 🙁 Having a flip cap is definitely an added bonus. As a reminder to Sriracha newbies, you need to shake the bottle before using so all the wonderful flavors can be properly mixed. Hey now Delilah – we found TWO coupons in the paper, and promptly bought 2 bottles of CHA! I’m glad your palate is happy! Thanks for letting us know! I really like the Texas Pete Sirracha. I’m pretty excited about it. I live in Maryland and bought it at a Weis supermarket in Hanover, PA (only about 25 miles from my house). Hey MikeT it’s become a fav here too. Will try this out. I like both Huy Fong and Shark brands. Shark is sold in Asian grocery stores. It has no preservatives at all and has more of a peppery taste than Huy Fong. I think you’ll like it, Sydney. I’ve tried the Shark brand too. Pretty decent sauce but on the thin side. Stumbled upon this at a local discount food market in RI. Bought it for the low price and was thrilled by the flavors, texture and heat. Flavor lingers pleasantly upon the palate for a time after consuming. I’m a new fan and plan to make a special trip to the store to stock up my pantry. Hey Lazarus, I’m glad to hear you liked it. I think TexasPete really did a good job with CHA! 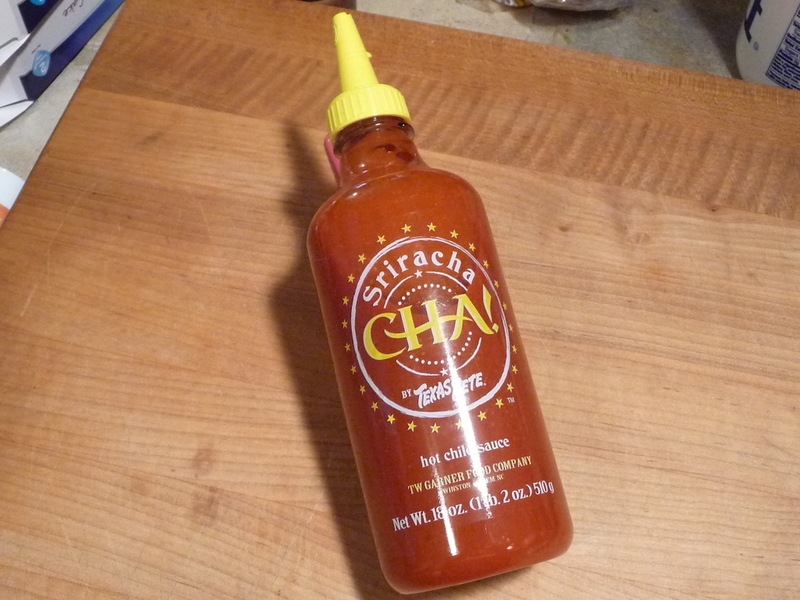 Plus this puts sriracha into the hands of many people that might not try it otherwise. Not a huge fan of the regular texas pete hot sauce but I think Cha is a grand slam home run for them. Hey Stephen. I’m glad you like the Cha! and thanks for the comment. I agree. I just got done finishing up a bottle of Texas Pete Cha! It isn’t bad, it tastes a little sweeter than the Sriracha from Huy Fong, and not as much garlic. While I prefer the Huy Fong version, Cha! is a close second that I wouldn’t hesitate for a second to pick up if the Huy Fong Sriracha wasn’t available. Thanks, Joe. That’s a pretty good summary. And thanks for subscribing. I only recently learned about Sriracha Chili Sauce through a You Tube family “The LaVigne Life.” This is their favorite hot sauce. I googled the sauce to see where I could find it locally. I am working on my grocery list and wanted to include this wonderful sauce. We always buy Texas Pete Hot Sauce. Needless to say, I was pleasantly surprised to see an article about Texas Pete having created a sriracha sauce in the Trisd area. I am so excited. I live in Wilmington and shop at Lowes, store #199. I hope this store has it in stock. I sort of wish the cap was green instead of yellow because I like the “festive” look of red and green! That is the color of the bottle that Jerry LaVigne, Jr., the Vlogger, and his wife use. I can’t wait to order my groceries when the store opens. I love Lowes Foods to Go because for a very small fee, they will shop my weekly groceries for me. It’s so convenient to go and pick up my groceries. They even bring the groceries out to the car. You can’t beat that for service! Hi Lynda. Thanks for reading HotSauceDaily.com and for leaving a Comment! I hope you find either the Huy Fong or the CHA! by Texas Pete. Come back and let me know what you think of them.